OK, we all know that the NFL draft is now a huge business and owns a significant chunk of the off-season attention of fans. The “who’s rising” and “who’s falling” mock drafts are priceless little comedies on their own. To stand back and look at the amount of ink and pixels spilled for months is alternately bewildering and just a plain hoot. But the draft itself is, to be honest, kinda dull. Sure, we are all interested to hear what our team does, and the teams we hate too. And we are captivated by the projected picks who fall Icarus-like from where they were “supposed” to go (I’m looking at you, Barkley). But the whole things needs more oomph. More drama. More entertainment. So with that in mind I’ve come up with (I was going to write “drafted”…) a list of rules that the NFL should implement for the 2014 draft. 1. Quarterbacks can only be taken in the 1st and 7th rounds. First off, if you don’t think he is a star in the making, don’t draft him at this position. Just take a defensive lineman and move on. Second, this will make picks at the end of the 1st draft much more valuable, giving us trades and keeping me (frankly) from just going to bed. 2. Teams may only draft two players from the same conference. Teams also get a 3rd round compensatory pick in next year’s draft if they don’t take any players from the SEC. Variety, people! 3. Following a coin toss (not by a replacement ref), either the 2nd or the 3rd round will be conducted as a speed dating 2 minute round. 4. Teams may draft one punter, kicker, designated long-snapper, or Australian Rules Football player at any time without surrendering a draft pick. 5. In rounds 5 & 6 player picks will be randomly drawn from a hat. C’mon Roger Goodell, work with me here! Posted on April 28, 2013 by bilcummings. 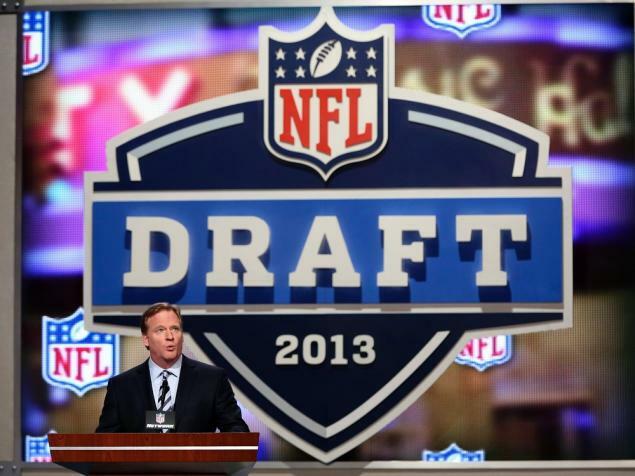 This entry was tagged draft, football, mock draft, nfl, nfl draft, roger goodell. Bookmark the permalink.